Sometimes I think about everything I need to juggle in life and I feel overwhelmed. However, I have to pause and consider that on top of all of that, I can’t even fathom also being responsible for four other little lives, like my sister. That’s when the image of a hero mom wearing a cape like Superman comes into my mind. Moms do so much and as a small token of our appreciation, we have (at least) one day a year to make it all about them. This year, Sport Chek has put together a gift guide for active moms with sought-after items under $25, under $50, and under $100 to fit your budget and to bring a smile to mom’s face. My top pick under $25*: Why are socks typically thought of as a Father’s Day gift? For my last birthday I really did ask my mom for socks! I think she’d appreciate some sporty ones for herself too. My top pick under $50*: For the yoga mom, running mom, and all around active mom, pick out some Urder Armour crop pants. For after hours, beach time, patio & wine time, casual wear and dresses are also a great pick for mom. My top pick under $100*: Casual boat shoes (also great for patios, farmers markets, and hanging out with family in the backyard) are slip-on essential for summer. Of course we can always anticipate a few showers or foggy mornings now and then, so a shell jacket is the ultimate West Coast must-have. I will draw one winner at random from all entries on Tuesday, May 10, 2016 at 12:00pm. Follow Sport Chek on Facebook, Instagram, and Twitter for more information. * Prices reflect those as-published online May 5, 2016 and may be subject to change. Update The winner is Coral! Sport Chek, mom would love that! that would be an awesome mothers day gift for myself need some yoga pants, thx sportcheck. Nice, I could find some stuff at Sport Chek! Have terrific variety of items at Sportcheck! would lOVE to win this! Great workout items for my rehab and physio exercises! This would be perfect to help kick start our summer outside! Love love love those Sanuk shoes. This would be a great gift for my wife… she would love to go to SportChek to shop for some quality casual clothes so we can go hiking etc.. I could sure use some new sneakers. What a lovely prize for an even lovelier mom! Great gift for your mom and she can pick out what she needs. i’d love some new sneakers! would love to get some new runners! I really need new runners. I always find great clothes at SportChek! Great gift items for Mom at SportChek. My mom deserves to upgrade her style with some new outerwear. Especially since she lost her husband a few months ago. it’s nice when something can be bith practical and decadent at the same time! My mom loves those muscle relief balls! Thanks for the gift ideas! Tweeted to! Thanks for the chance! New walking shoes for mom! My mom’s 89 and very active. Sports Chek would work for her. My mom’s would love the socks. And my wife the massage items. My mom would love some running shoes!! I’d LOVE to win a $200 GC for Sport Chek – I’d buy some new walking shoes & some breathable socks! Great Gift Card for my Mom…tweeted. My sister is a well deserving mom of 3! There are some great gift ideas for Mother’s Day at Sport Chek! Who knew Sports Chek had so many good ideas for Mother’s Day? Thanks for the post and the giveaway! My mom would really appreciate this for sure! I’d love to get some new golf clothes. I would love some new running and/or yoga gear for Mothers Day! Mom would love this… great gift ideas too! Wow, I didn’t know there was so much variety at Sport Chek! Thanks for the giveaway. Would love to get Mom a gift from here! Shoes for everybody – how awesome would that be?! Mom would appreciate the gesture! Would love to be able to splurge on some new Adidas! Would love to win for my mom! yes please! would love some new running shoes. Thanks for the gift ideas! 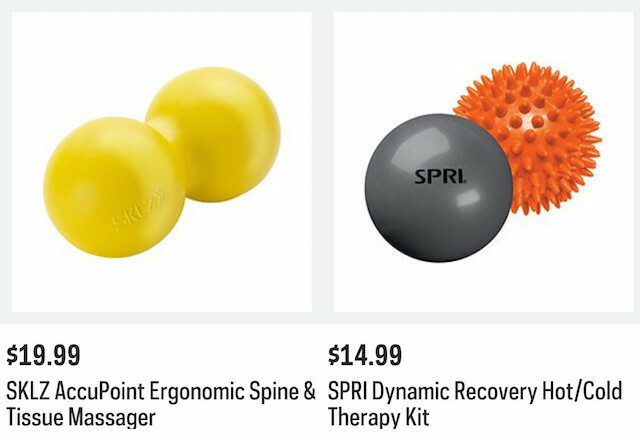 Sport Chek has a great selection of items to choose from. would love to be able to give back to my mom this weekend! Great prize….although I would probably end up buying something for my kids instead of myself! Sport Chek……….just great for comfy running (read wear all the time) shoes !! $200 can buy some fabulous looking workout wear and/or shoes at Sport Chek! This would be awesome to win. I need a new pair of runners for work. Always looking for new hiking boots! This would be awesome to win. Thanks! My mom is trying to be more active this year and these would be great for her! Sport Check has some great products. I love shopping at Sportchek! They have great stuff! Thanks for the chance to win! 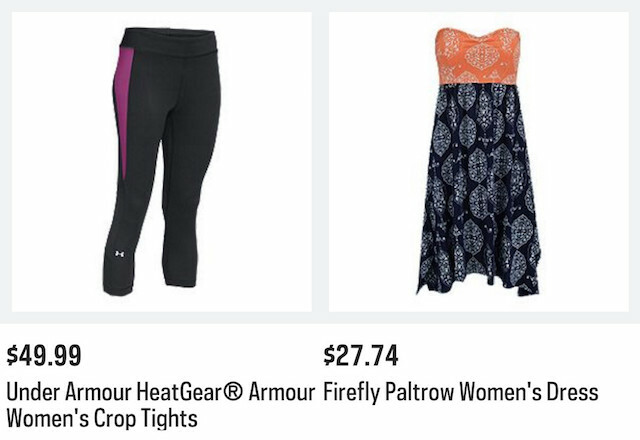 I really like the Armour Firefly Paltrow Women’s dress for under $30. It would be perfect for the summer months, and what a great price! This would be awesome! My kids always come first (I have 5 boys) so there is never anything left over for me. I could definitely put a Sport Chek card to good use. Thanks for the chance. Would love to win! Just discovered it’s time to replace my hockey pants and the gift card would be perfect for that. great selection , would love some new runners! thank you for the giveaway! What a great prize. I like the list of gift ideas you have given. Those yacht shoes really caught my eye. Perhaps for me. this would be a wonderful surprise for a wonderful mom who taught me how to cook, bake, can pickles, make jams, garden, be amazing! 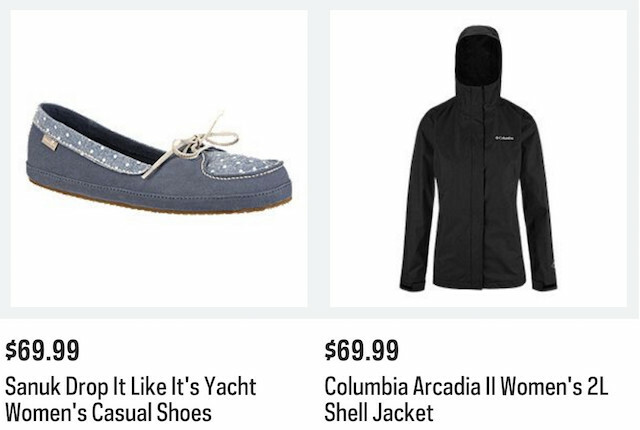 I really like the yacht shoes and the columbia jacket. SportChek has so many great clothing for workouts. I need to stock up for summer! I would love to go to sportcheck and buy some fashionable workout gear. My mom is in need of some new clothes! She’s been wearing the same oversized tshirts to go on our walks since I was in kindergarten! ..I’m almost 30 now! I absolutely love shopping at SportChek. I always find jackets and shoes I want. This would be wonderful! I need some more workout gear to get me motivated! My mom would love this! She definitely needs more workout gear. The hot cold kit is a great idea for treating those aches and pains. The spiky ball vaguely resembles a dryer ball. Can it do double duty? I just had a baby on April 28th so my first mother’s day is tomorrow. And the best part? My mom is flying in to visit me and her first granddaughter! But once all the visitors are gone, I am most looking forward to getting back into pre-pregnancy shape and would LOVE to win this gift card to buy some new gear! I love Sport Chek and would have no problem spending this GC as they have so much choice. I like to get my running shoes from Sportchek when they are on sale as they always have a great collection. I would love to get a pair of Merrick sandals from them this year for Mother’s day as my old pair have finally given up after about 6 summers of constant use. I did not know they carried dresses -I will have to check that out. Wow, this would be amazing. We always head to Sportchek first when we need new runners. The cloths are always great quality and they have Great Sales!! We just bought our grandson his first bike from there this year 🙂 Thank you for this Fantastic giveaway !! It would be so much fun to walk into the store with a Gift Card. Uber awesome gift for mom! 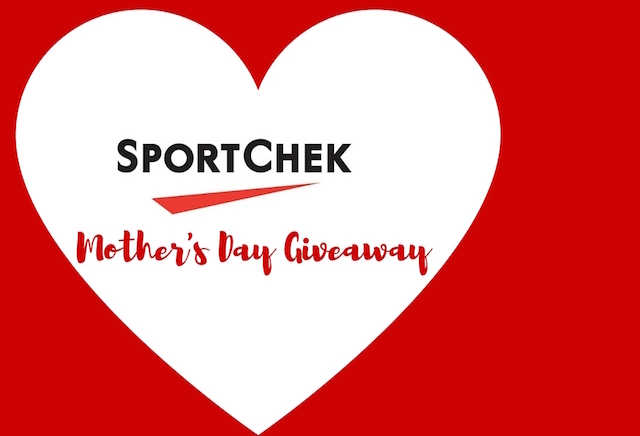 This gift would be wonderful–so many choices at Sportchek for Mother’s Day! Love to win this for mom and inspire a semi-active mom that has retirement time of her life. New pair of runners, a new track suit or both… she would Go Mom’s Day! I just might have to buy those Sanuk shoes! $200 for Sportchek would the perfect amount to get my mom a new wind jacket, and maybe have some leftover for me as well! Nice prize! I’d use it to buy an activity tracker. Love SportChek….would love to win….need a new coat and shoes! I love Sportchek and so does my mom. Thanks so much for the chance! thanks for the chance to win. I’m due any day so would definitey love this. I desperately need some new clothes… kids always come first, mom needs a turn! Great prize, thanks for the chance! I would love a $200 Sport Chek gift card, I have 4 teenagers so it would help alot! Great Gift ideas and a super prize! Great giveway! (and great suggestions!). I too have discovered the benefits of comfy, supportive sport socks and have converted my daughter as well. They make a terrific gift for anyone (not just Father’s) and Sport Chek has an awesome assortment. Lovely gift. Thank you for the opportunity. What a treat this would be. This would be a terrific gift!! Especially for my active momma. My mom is in bad need of a jacket! It is such a nice Mother’s day prize. Thanks for sharing! What a wonderful giveaway, this would be great for my mom! These are great items to win; thanks for the chance. This is so rad! Would love to win. I always shop at Sport Chek. Thanks! Awesome,thanks for the chance! This would be wonderful!! Thanks, could use some new workout clothes. I love Sport Chek’s Superfeet orthodics. Great value, great product. This is the perfect prize for mom! Great contest I love sportchek!!! My wife loves sport chek! Thanks for the chance! Mom would love this! Love Sport Chek clothing. I go there to get the warmest winter wear. This is the perfect prize for my Mom! ? Wow this would be amazing. Love workout gear! My mom could use some new runners! Great prize! New shoes and socks for Mom would be fabulous. Would love to get my mom and I some matching sneakers to motivate her to walk more. Perfect way to get my mom to do more sports! Great! I would love to surprise my wife with a new jacket. You’ve highlighted some great items — I’d be interested in some of them myself. Who knew you could buy a dress at Sport Chek? I also could really use a new pair of walking shoes! 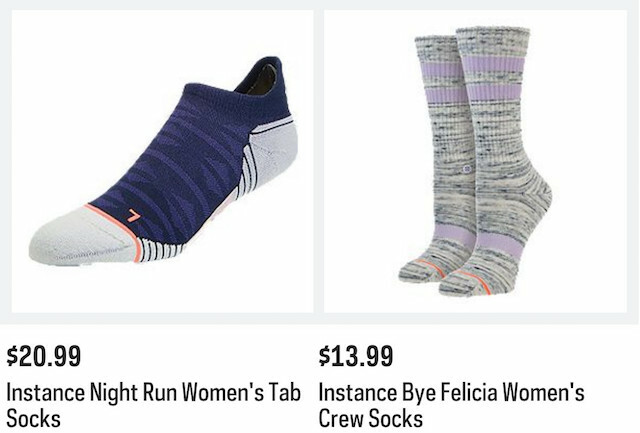 Mom is not the athletic type but I know she would like to pick up some of the featured Mother’s Day gift ideas from SportChek. Great stuff, love that cute dress , and the price to ! My Mom is not the athletic type, but she would love the Ergonomic Spine & Tissue Massager! But I would certainly make do with some new workout gear! I like the Columbia coat and most everything else from Sport Chek. As a mama I always buy for my kids. This would be guilt free shopping for me!!! Oh this would be great to buy myself some new runners! Love the shop, I could really use some new runner shoes. There are so many things I could buy at Sport Chek with the gift card. Thanks for the chance. What a wonderful contest – so many great things to buy here! sweet prize! this would be awesome to win! great contest! I love sport chek. Great selection and prices. Thanks for the chance! I would buy new bathing suits for this summer if I won! I got the most comfy pair of sport sandals at Sport Chek last season. I really like that store. Love that store..and so do my kids. I would have to hide the GC!! Thanks for the chance! Not a month goes by that someone in this house doesn’t need a pair of new sandals, boots or shoes! With all the changing seasons, back to school, and just plain ol’ outgrowing them, there is always a need for new footwear & Sport Chek has all the best brands for everyone in our family! I love, love, love Sportchek. I’m someone who is very active and constantly outdoors and this store has everything I need! Sport Chek has been blessing through hockey and soccer teams for the kids — still pick up mouth guards for hockey there. Great gift ideas! I like the Columbia jacket. I just got new shoes yesterday. This prize would help me make a complete summer workout outfit! I love shopping at Sport Chek; they have great deals on kids shoes! Great prize. My mom could do a lot with that! Teenagers are expensive! I’d love to win this. Nice to see real gifts that would get used. oh my, i would LOVE to win! Getting in shape requires gear. This would help! Would be an excellent prize, could really use all kinds of things from SportChek! I love SportChek! Great prize! Thanks so much for posting this great giveaway. We love SportChek!! This would be an awesome gift for my mom! She would love some new workout gear. I could treat my mom to a pair of runners for her walking! What a great prize! Thanks for the giveaway. This would be fantastic to win. I love shopping at Sport Chek. This would be a great way to start the summer, thanks! I love Sport Chek – have only got my husband shoes there so far – so would love to win GC so I could get shoes for myself. I walk 2x a day so really need some new comfy good quality shoes! Hope I win, so I can get some gym gear! Love the new flagship Vancouver SportChek! I love sportcheck. Would be a great belated mothers day gift! Today is my mom’s birthday and she will love these items from SportChek! It will be a nice mother’s day/birthday gift for her. Would love to win this-thanks!! I love Sportchek for my workout gear. Lots of great things to choose.